Dunsinane in Chicago, February 26-March 22! From the National Theatre of Scotland and Royal Shakespeare Company comes DUNSINANE, the imagined sequel to one of the most famous plays set in Scotland: Macbeth. Earlier this year, the play had its US premiere and will show for a limited time only, from February 26-March 22 at the Chicago Shakespeare Theater on Navy Pier. To learn more about the play or buy tickets, visit the Chicago Shakespeare Theater’s website here. This entry was posted in Associate Events and tagged Chicago Shakespeare Theater, David Greig, Dunsinane, Macbeth, National Theatre of Scotland, Roxana Silbert, Royal Shakespeare Company on February 25, 2015 by Sara Heegaard. 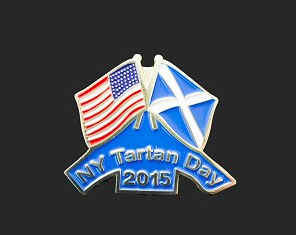 Purchase your 2015 Tartan Day Parade Pin Today! The Tartan Day Parade is fast approaching… register here for the NYC Tartan Week Parade on Saturday, April 11 and purchase your 2015 New York Tartan Day Parade Lapel Pin, now available! The pin is a perfect addition to your parade attire, whether you’re spectating along the route or marching with us! If you are a Member or Friend of the ASF and wish to march with the American-Scottish Foundation please complete this form so that we can register you as marching with us. The Parade starts at 2:00 p.m. on April 11 at West 45th Street and marches up 6th Avenue to 55th Street. This entry was posted in ASF Events, Scotland-Tartan Week and tagged Tartan Day Parade, Tartan Day Pin on February 25, 2015 by Sara Heegaard. SXSW (South by South West) is the largest music industry conference and festival in the world, and the Scottish Music Showcase at the Festival is delivered by Creative Scotland in association with the Scottish Music Industry Association. 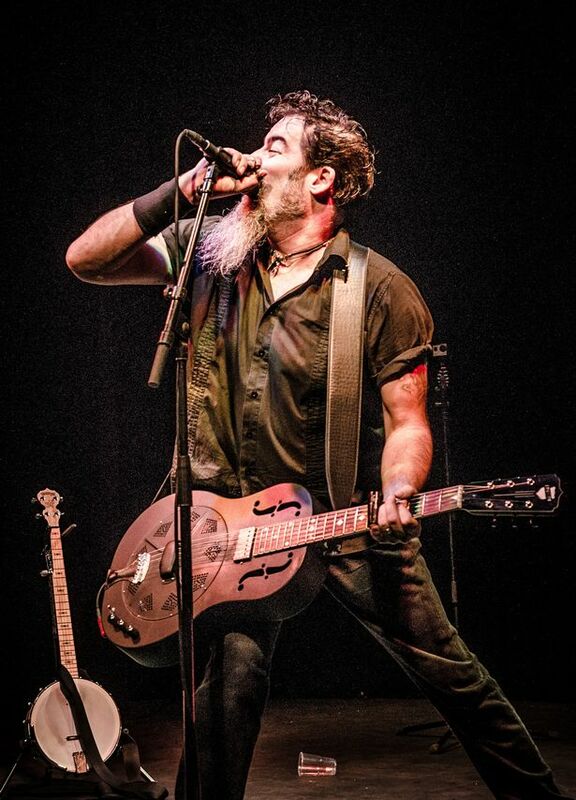 Dave Arcari, one of the Scottish acts heading to SXSW. Photo by Bill Gray Photography. This entry was posted in News and tagged Dave Arcari, Fatherson, Hector Bizerk, Holy Esque, Redinho, Roddy Hart & The Lonesome Fire, Scottish Music Showcase, SXSW, SXSW Music Festival, The Amazing Snakeheads, The Twilight Sad, United Fruit on February 25, 2015 by Sara Heegaard. The American-Scottish Foundation® is honored to have been invited to join the Landmarks 50 project and to develop and present an exhibition celebrating the contribution of Scottish Americans to the building of New York. 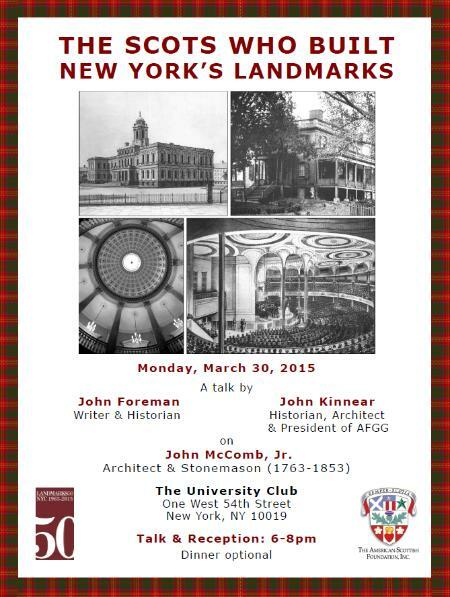 Join us on Monday, March 30, 2015 from 6-8pm for a talk on John McComb, Jr, a noted New York architect and stonemason of Scottish descent who was responsible for many of New York City’s iconic buildings. The illustrated talk by John Foreman and John Kinnear will take you through his personal history and achievements. To book tickets, or learn more about our speakers, please visit our events page. We hope to see you there! This entry was posted in ASF Events and tagged John Foreman, John Kinnear, John McComb Jr, Scots Who Built New York's Landmarks on February 13, 2015 by Sara Heegaard. With travel itineraries organized around events, markets, different foods and drinks, and more, as well as non-culinary activities and sights to see in the area, the eBooks were recently profiled in The Herald Scotland and are sure to be a helpful resource for travelers, food lovers, and anyone looking to delve deeper into Scotland’s rich culinary history. Malcolm Roughead, chief executive of VisitScotland, said: “Scotland’s famous food and drink comes from its unique landscapes, unspoiled habitats and varied weather, which is perfect for producing a wide variety of high quality fresh fruit and vegetables, fish, meat and much more. “This year, as we take Scotland to the world, we celebrate the role that food and drink plays in shaping our economic and tourism success. “I hope this e-book provides some food for thought, not just for visitors but also people in Scotland. To download the eBook or learn more about the Year of Food and Drink 2015, click here. 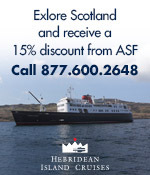 This entry was posted in Associate Events, Travel in Scotland and tagged Year of Food and Drink Scotland on February 13, 2015 by Sara Heegaard. 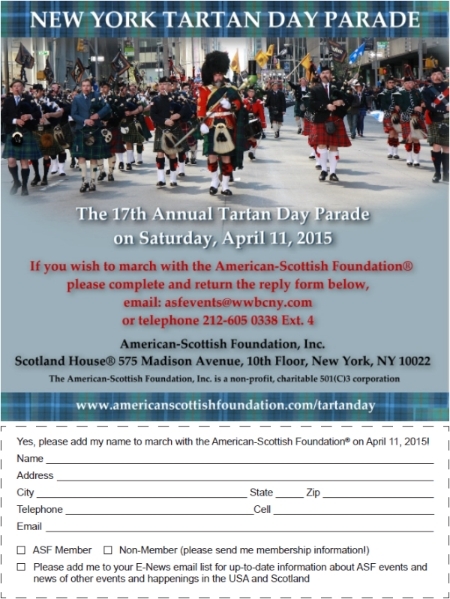 March with ASF in the 17th New York Tartan Day Parade! On April 11, 2015, join us as we march up 6th Avenue with pipe bands and dancers to celebrate our Scottish ties! Let us know if you’d like to march with us! If you are a Member or Friend of the ASF and wish to march with the American-Scottish Foundation please print out the image above or complete this form so that we can register you as marching with us. The Parade starts at 2.00pm on April 11 at W45th Street and marches up 6th Avenue to 55th Street. This entry was posted in ASF Events and tagged Tartan Day Parade, Tartan Week on February 13, 2015 by Sara Heegaard. 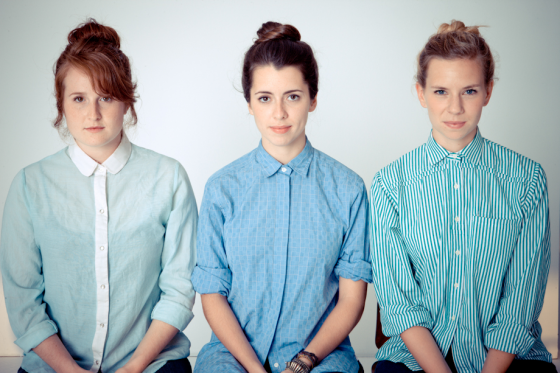 Featuring gorgeous three-part harmonies from Ms. Read (voice/fiddle/acoustic guitar), Tamsin Wilson (voice/acoustic guitar/dobro), and Megan Lui (voice/electric guitar), who hail from Scotland, California, and England, the song is masterful in its blending. We can’t wait to hear the rest of the album! This entry was posted in News and tagged Burns Supper, Embers, Hannah Read, Megan Lui, Tamsin Wilson, The Bluegrass Situation, The Isles on February 11, 2015 by Sara Heegaard.